Enjoy the fall harvest, eat local, and be creative! Fall produce offers options to many dishes. Fall produce – butternut, acorn, pumpkin and other winter squashes. Kale, brussel sprouts and other greens. Apples, pears and cranberries. Apples and butternut squash cooked together make a delicious soup, with thyme, sage, or warm spices like cinnamon, nutmeg and ginger. A little blue cheese adds a unique flavor. Roasted squashes are sweet on their own, or pureed into a dip with garam masala and a little tahini. Add cubed roasted squash to a lasagna with a bechamel sauce and asiago cheese for a fall inspired dish. Acorn squash is great baked with maple syrup, or stuffed with quinoa, feta, sunflower seeds and cranberries. Apples, sausage, currants and cornbread make a hearty filling too. Steam squash halves over boiling water or microwave whole (pierce well to avoid exploding gourds) for a tender option to baking. Cube squashes into your favorite stew recipes for color and antioxidants. Spaghetti squash is a low carb alternative to pasta, and roasted pumpkin seeds are just a tasty benefit of the orange globe. Pumpkins are edible in savory or sweet recipes, adding vitamin A to your dishes. Think cake, bread, stews and risotto. A hollowed out pumpkin provides a festive serving bowl – just skip the Jack-o-Lantern cutouts. Kale, collards and other greens can be bitter, pairing nicely with sweet raisins, apricots or roasted garlic. A touch of balsamic adds extra depth and a little tang. Add greens to soups, stews and even baked pasta dishes for an extra kick of calcium. If the bitter flavor turns you off, drop your greens in a boiling water bath for 1-2 mins, drain and saute to cut down the bitterness. Apples or pears and cranberries are a natural pairing for applesauce, pie fillings, chutneys or strudels. Pears and pork are wonderful, cooked slowly with honey, broth and herbes de Provence. If you prefer, use thyme, cream and shallots. Braise chicken or pork in apple cider or use to poach salmon. 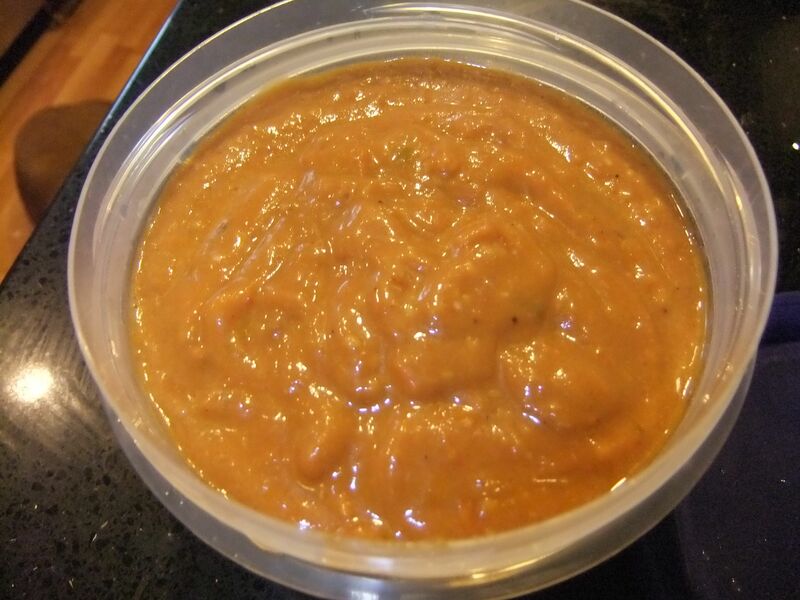 It is wonderful for basting your turkey, adding a sweet flavor to your Thanksgiving gravy. Heat cider with cinnamon sticks, cloves and orange peel for a warming drink and homey room freshener. Poach pears in simple syrup infused with lemon, orange or vanilla beans. Use red wine for a more dramatic presentation, adding orange peel, sugar, cinnamon stick and cardamom for more flavor. Bake apples filled with nuts and honey, orange zest, or an oatmeal raisin and brown sugar filling. Sliced apple with a little peanut or almond butter is a quick energy snack, or chop an apple into cottage cheese with cinnamon and raisins for a great breakfast. Slice pears in a salad with blue cheese and pecans. Dip pear slices in chocolate for a decadent dessert or add moisture to a favorite spice cake recipe with chopped apples or pears. 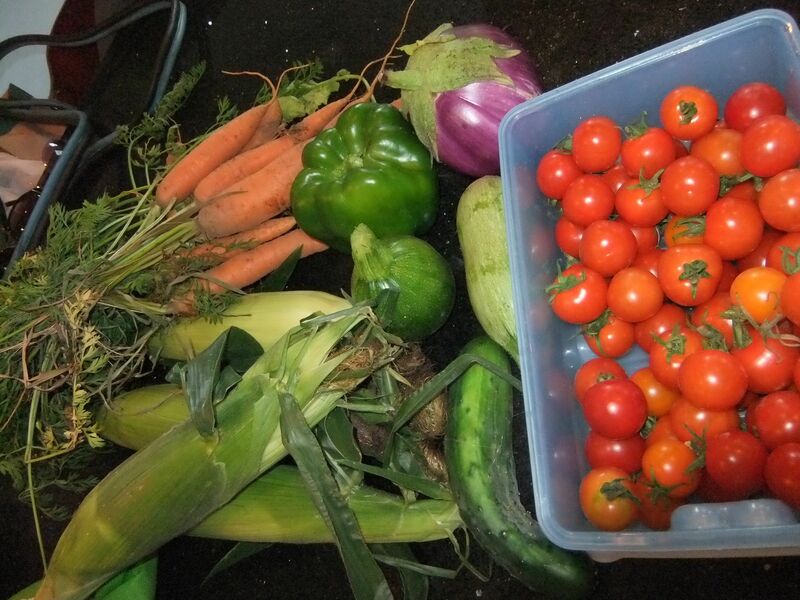 Enjoy fall produce, eat local, and be creative! Good eating and happy holidays. You thought I forgot, or was lost in the cornfields….perhaps taken away by a ground hog with a vengence, but I just got really busy this past week. Sadly the week of July 29 was a bounty of zucchini, corn, peppers, jalepeno, eggplant, mezuna, green beans and more summer squash. I needed to step out on this one and resorted to a favorite standby – grilled veggies. With fish, delish. Leftovers ended up in a lasagna with a little goat and parm cheese (trying to clean the fridge out, you know) The mezuna ended up in a stir-fry with leftover smoked chicken, carrots from the CSA ( I think the week before?) onions and the mezuna. Red curry sauce made this dish spicy and colorful. The week of Aug. 5th, corn, beets, radishes, a pepper, carrots, more zucchini, cherry tomatoes, arugula, kale an eggplant and cukes arrived. Saturday was spent creating and cooking. A roasted tomato sauce with the pepper and garlic roasted in EVOO, salt, pepper and rosemary. Pureed and to the freezer. Zucchini ended up in a chocolate buttermilk cake that was moist and rich, no hint of a veggie inside. A caramel icing topped this sheet pan cake to be shared with family. The beets were caramelized in orange juice and maple syrup and cooked down. Then a little triple sec added, again cooked down until syrupy. This was added to the middle of a bundt pan cake with walnuts and baked. Wonderful dense cake with a unique twist from the beets. 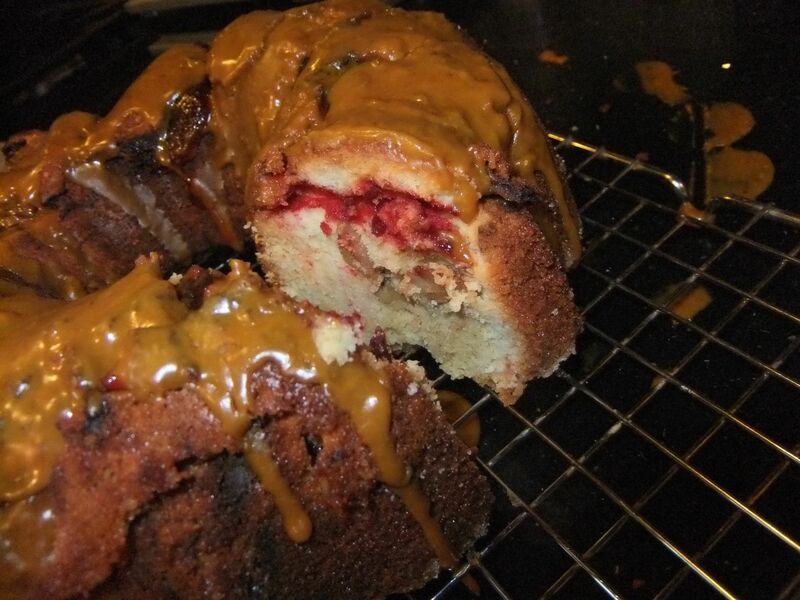 However the beets did stick a bit on the bottom and broke the cake, but that’s ok – this one was for us…..glazed with a little of the caramel icing leftover from above cake. The beets were sweet, adding nice color when you cut the cake. pound cake with beets on top made in a bundt pan. The carrots were cooked with a leek, broth and harissa, a red chili pepper and spice mix paste used in a lot of African foods. Wonderful flavors and heat, with the fresh carrot taste just beaming through the soup. Corn will be enjoyed in a salad with the arugula, radishes, cukes and some tuna, perhaps with a lemon vinaigrette. And a glass of wine….which should be a nice Sauvignon Blanc or Chardonnay, but will more than likely be something red. I think there is a bottle of Cab Franc open. The eggplant? hmmmm need to think on that – one is not enough for moussaka, but it is a large enough one to have twice. May eggplant fries with our steaks tomorrow? We’ll see. Next week we are giving our share to my in-laws as we won’t be able to pick up ourselves. But I will be back to tell you all more the following week, and may have some great food stores from Maine! Is it blueberry season yet? Have a great week, grill, eat local and enjoy! Peaches are right around the corner! Cooking can be very intimidating to many people for a variety of reasons. When it comes to international fare, that stress level can rise. When traveling, as I have been blessed to have had the chance to do quite a bit in my lifetime, I found a lot of common ground across the lands. Today, I will share fish stews with you. In San Fransisco, Cioppino is the local favorite made with shellfish, whitefish, tomatoes and oregano, thyme and or basil. Sometimes wine is added for depth, and served with a nice crusty sourdough on the side. The French have Bouillabaisse – mixed whitefish, shellfish (typically of Mediterranean descent) with tomatoes, onion, fennel and saffron. They serve their stew with croutons. In Italy Zuppa di Pesce is a favorite with variations region to region. Once again shellfish, whitefish and tomatoes take center stage. A little white wine, parsley (Italian of course) and a side of crusty Italian bread finishes this meal. The spanish have Zarzuela de Mariscos – tomatoes, bell peppers saffron, herbs and mixed shellfish with almonds to thicken. Puerto Rico has Asopa de Mariscos with the same ingredients, but no almonds. The Portuguese have Cataplana, named for the copper cooking vessels used to cook the stew. Tomatoes, saffron, bell pepper and mixed seafood with a touch of cream all go into the pot. Brazilians have Moqueca with whitefish, tomatoes, and coconut milk. They also add Piri Piri sauce – with lot’s of garlic and olive oil. Head to the South, and gumbo takes center stage – bell peppers, tomatoes thyme, basil and a little celery. Of course a little andouille sausage for flavor – it is the south after all – and okra, shrimp, scallops and crab. Sometimes it is just shrimp – depending on the chef. So you see – we all eat our seafood in delicious tomato baths, with a nice crispy bread to soak up those juices. Well all of us outside of New England……even Manhattan does a tomato based clam chowder! So go enjoy the local seafood – and keep watching as I compare another favorite dish that spans the globe!